Hit it straight with your driver. It's not that hard! YOUR DRIVER: WHY CAN’T YOU HIT IT STRAIGHT? The most prominent problem for golfers today is trying to hit it straight with their driver. They spend countless hours on the driving range and tons of money on lessons and chase the newest technology that each O.E.M. comes out with, mostly every six months. Accuracy is on every golfer’s mind almost every time they tee it up. There is nothing more frustrating than to consistently play out of the rough after you hit your drive. Your driver is one of the most important clubs in your bag, and usually your most expensive part of your equipment. Golfers change there driver more than any other piece of equipment, and are continually bombarded with the newest gimmick from all the O.E.M. companies. DON’T THINK IT HELPS THE AVERAGE GOLFER! Golfer’s can benefit from some tips that will help them HIT IT STRAIGHT! No matter what exotic driver you have in your hands. HIT IT ON THE SWEET SPOT !!!!!!!! Mostly thru practice, but there are a few things you need to know first. 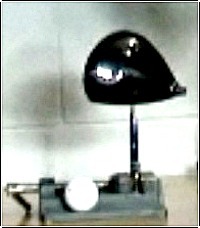 First, you have to understand that the sweet spot on the face of a driver head is no bigger than a pin head. 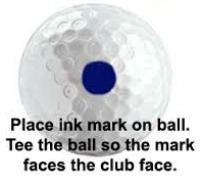 We clubmakers have a crude way of finding it, as you can see in the above image. But it works. We mark every sweet spot when we build a driver, and drill into our clients: You must hit it there every time in order to hit it properly. I could get into center of gravity, multiple sweet spots, M.O.I., center of gravity, graduated roll technology, twisted face, but no worries, try and learn how to hit it on the sweet spot. This is not a technology driven article. Trust me, to hit it straight, you must learn how to hit it there. Now, you have to understand what you are actually doing when you swing your driver. Most amateurs either swing INSIDE OUT or OUTSIDE IN. This causes you to hit the ball all over the face, but in reality most of us can’t correct that even with a boat load of lessons. You know what comes next: “CUSTOM FITTED DRIVER” A driver fit for the golfer’s swing, not the swing you see on TV, or in all those videos you have watched or purchased. Now, there are lots of other technical things to worry about, like Lie, Loft, Shaft Flex, but this article is all about learning how to hit it in the fairway. You can find all the technical wizardy of your golf equipment, elsewhere on our site. THIS IS SIMPLE--- BUT EFFECTIVE!!! 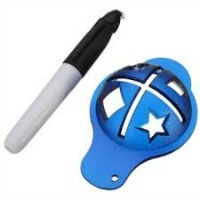 We mark the ball with a dry eraser sharpie (dry erasable so you don’t permanently mark your driver face or the balls) either in a straight line or a dot, and tee the ball so the mark faces the center of the club face, and this will simply show you where you are hitting it. 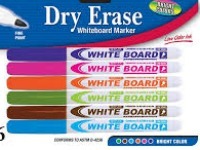 You can wipe it off after every hit to start again. HOW DO I CORRECT THOSE MISS HITS??? It is a proven fact that 80% of amateur golfers hit the ball on the heel on a consistent basis. 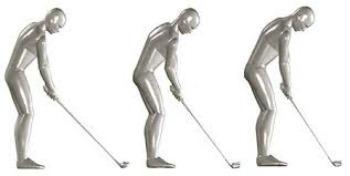 NO MATTER HOW UNATHLETIC YOUR SWING IS-----YOU STAND A 99% CHANCE OF RETURNING THE CLUB HEAD TO WHERE YOU STARTED!!! SO THEREFORE, YOU MUST CHANGE YOUR ADDRESS IN ORDER TO TAKE YOUR SWING, AND HIT THE BALL AS CLOSE TO THE CENTER OF THE FACE AS POSSIBLE. HOW DO YOU DO THIS YOU ASK? You Could Finish Here ?????? You simply address the ball like the images above, or especially in a different spot all over the face than you have been doing all these years, and shift your feet a little closer or further back. Do something, but don't change your swing. Change your grip, grip it a little lower. 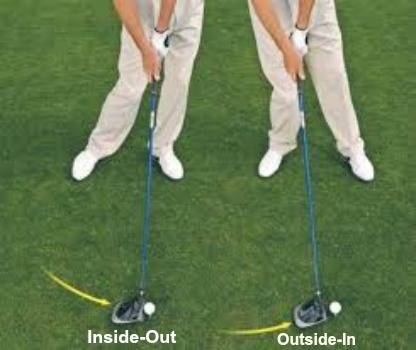 No need to change your swing that you have been using all these years, the slightest little adjustment will help. No need to go for hundreds of dollars of swing modifications, because you are what you are, and physically, I don’t think many amateur golfers can change anyway.